Favorite Hockey player (and why)? : I've got three, Steve Yzerman, because he's a great guy, a great captain, and increbibly skilled, but he went through years of losing, then sacrificed personal accomplishments to become a great defensive player and win two Cups. Also Chris Drury, because even though he's not the most skilled guy, he's determined as hell and comes up big when it counts. The third is Nicklas Lidstrom because he's got great skills and is unbelievably consistent, but he's not that flashy and he just gets it done. Jono D: Ant started in 94 and i played a little street hockey, so a year later i followed him to the Hornets. Jono D: Every time I play for Australia is memorable, but my first goal in PHL really sticks out. It was the first game of PHL, and there was like 20 seconds left in the first half and the score was like 2-2 against the Snipers. Someone shot on Doggy, I picked up the rebound, went around the back of the net and jammed it in the other side just as the period finished. 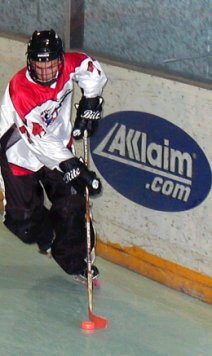 I really wanted to score in PHL and Taz said I went nuts. KB: What number do you wear and why? Jono D: For club I wear 74 because when I first started there were only two numbers, 74 and 85, and Bobby Jacques was in Bladeworx and he told me to take 74, so I did. For representative teams I usually wear 14 for something different. Jono D: To make an impact on a good National team and know I did my best. Jono D: The standard needs to improve enough that we can get on TV and get some exposure. For the standard to improve we need young kids to play a good standard so they can develop into better players than us. Jono D: I really have no idea. I just try to be as consistent as I can, so hopefully they think I'm consistent. Jono D: I'm still fairly slow, so I'd like to improve my leg strength so I don't cruise so much. KB: Besides the obvious what is the biggest difference between the players on the National teams from other countries and the players you play against in Australia. Jono D: In the case of the main countries (Finland, Germany, USA etc. ), they've all got great skills, are really big and play really well together. In the case of the younger guys, some of our young guys are as good, but they're ALL good, are well coached and are all on the same page. KB: Since being named the Captain of the Inferno has your role on the team changed? Jono D: It's a little different getting used to having to worry about everyone on the team, but we've got a good team and Jamie Edwards does a great job coaching us, so all I really have to do is make sure I play as well as I can. KB: Do you play ice hockey? Jono D: Not really. I've skated a couple of times and it was fun, but I don't really like the standard of the ice so I'm not all that keen. I was going to start this year, but I've got too much school on, so I might play Summer. If a new rink was built I'd probably start. 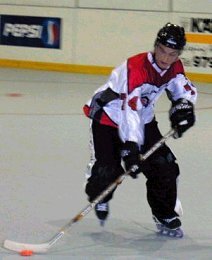 KB: Is it necessary to play ice in order to get to an elite level in inline? Jono D: It wasn't necessary for me, but I played a lot of inline to make up for the rink time I missed out on. KB: What do you see yourself doing in ten years time? Jono D: I have no idea. Hopefully I'll have a job... but still be playing hockey, hopefully in an Australian National League. KB: Any advice for the junior players who look up to you? Jono D: Just play as much as you can if you enjoy it, and take rink time when you can get it!